PerseVerAnce wrote: I do not like this idea. There are still some lingering UI issues with this game where it's hard to tell what's connected to what. This is especially true in tightly connected network. Which node is connected to the highlighted b-coin mine? Black Ice or Guardian? Actually because a black ice can only link to 4 nodes, and if it was linked to the mine it would have 5, you can tell that it's the guardian. Starficz wrote: Actually because a black ice can only link to 4 nodes, and if it was linked to the mine it would have 5, you can tell that it's the guardian. That is respectable. But the UI is still implying there are 5 connections, even if it can only have 4. While I am fine with being misled by my opponent, my opinion is that the UI should never mislead me. That is why I disagree with suggestions that can add to confusion. For example, I would be fine with networks where everything is connected to everything, and it's hard to decide which node I should take next, as long as I am not mislead into thinking some node A is connected to node B, when in reality node C is. 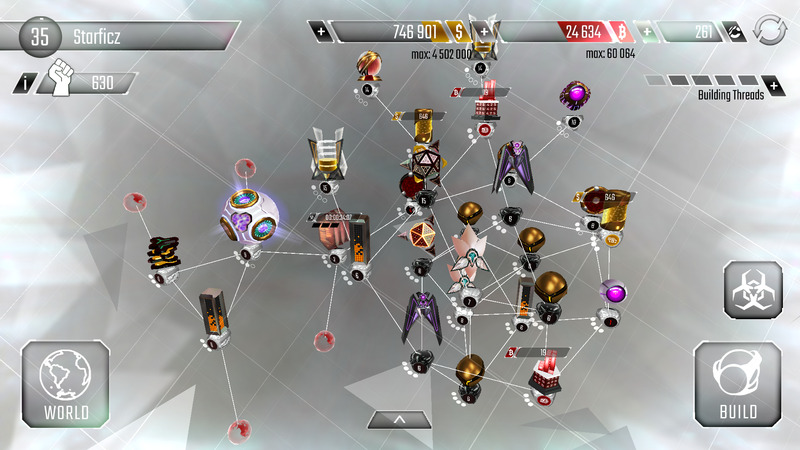 Marhex wrote: What about to add a option for the player to test and hack his own network. This! It's not hard to code and won't take much time. It would be very useful update. I have some ideas about viruses abilities and new node. I posted more on Hackers' Facebook (in private message), so here is only update of this what was, but if you want I can post rest of idea. I was thinking of the "shatter", that is a program that shoots a shard of pink 'glass' at an enemy node and the glass deflects to the other connected nodes, dealing damage to them too. This could, on the developing tree, be connected to shuriken. Another idea is the "P.R.Y.S.M. "(The y is deliberate). This is a program, that, like the ICE Wall and Protector, protects a node but also reflects half the damage back at the enemy node but takes the rest. Would have a little bit more HP than the ICE Wall. Connected, on the development tree, to the Shatter and the Protector. Finally, I have an idea for a defense that basically slows down the enemy programs in nodes connected to it, and the same as a program that slows down enemy nodes. Forgotten wrote: I really like those ideas! i actually really REALLY like this virus idea. i had been thinking of a virus actually that could apply somewhat like a worm actually and could tunnel into nodes two jumps away from one. so lets say you got a strong choke point and no way to portal behind it. you could use this ahead the choke point to get to the firewall nodes. the idea might be a little op though but it would prompt some very different network designs. an idea i have is actually a new security node idea. a special kind of sentry only this one you only get one on your network which basically is a nuker program. it randomly selects one taken over security node ever 20-40 seconds and obliterates the virus infiltration. specifically i say security node because otherwise it wouldnt be too effective, itd take over that program library youre using on a net connection lol. but itll pick a random security node not including the core and fully restore the node. possibly buffing it for a while? not sure if this should apply to things like wraithed nodes or not since those nodes arent so much taken over but have all functionality removed as well and dont transmit antivirus. another idea i have is for almost like a perk mutator for stuff like security nodes. something so like... you could use this node to research lets say on a code gate, you can get a buff for them so nodes on the other side of a code gate cant be seen unless the gate is taken over or wraithed in which case you can see past it. this seems more like something that would be accurate since as far as i know, code gate's are supposed to emulate passwords in networks and you cant really see whats past a password on a network without you know... hacking into it. maybe that could be something like a quality of life change on the devs part idk lemme know what anyone thinks. another idea for a security node is one that works similar to a sentry but with a slight twist on the guardian style of node again a high level node that can be connected to 4 nodes or less, that essentially works as a VERY short range scanner. so lets say you have 2 black ice and 2 turrets connected to this node, if someone tried to install an access, portal, or wraith on any of these nodes it would spike the sensitivity of the network significantly. so at higher levels (since im assuming more stealth programs or mechanics will be added over time) stealth becomes much more of a gamble. again this would come later on. Beam Cannon > Electric Cannon - Attacked node has 10% lower damage. Plus, it now shots with lightning. 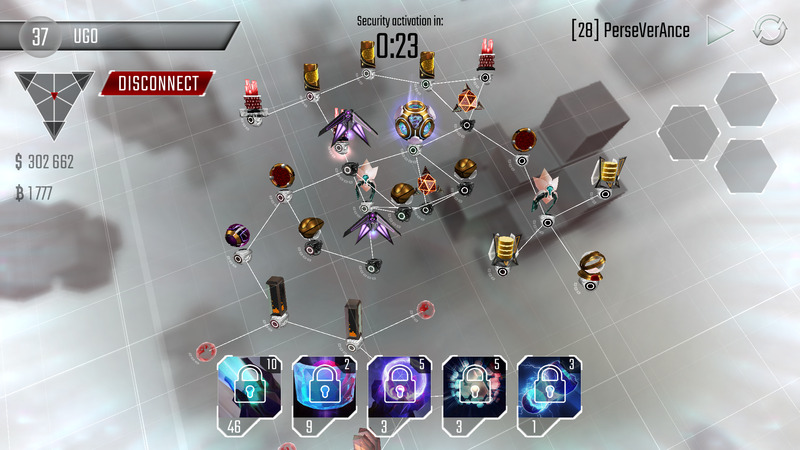 Blaster > Fire Blaster - Every time Fire Blaster hits targeted node, it will lose 1% of it's Firewall for 2 seconds. Plus, hit node will "burn" (for 2 seconds). Data Leech > System Leech - When it downloads data from Core / Money / B-Coins it removes Sentry antivirus too. It can now be installed on every node with antivirus (even on security nodes). Access > Tricky Access - Every node that had installed Access will be frozen for 3 seconds after stealh detection or after instalation of brute force program. Wraith > Dangeours Wraith - Wraithed node has 50% lower Firewall that can't regenerate itself. Portal > Wormhole - When you install a brute force program on node "accessed" by Wormhole, all connected nodes fill be frozen to finish it's instalation. There aren't all viruses, but for me it's good enough as 1st version of idea. Working - When connected node doen't have full firewall, it starts to heal it with continuous green ray. Proritets : Attacked nodes, Low Firewall security nodes, High Firewall security nodes, Core, Nodes with Sentry Antivirus, White nodes, Uprading nodes, Wraithed nodes.